1. The corneal reflex is a consensual disynaptic reflex. *The cell bodies are found in the mesencephalic nucleus of CN V. CN - cranial nerve. 2. The jaw jerk reflex is a monosynaptic myotatic reflex (Figure 10-3). 4. The oculocardiac reflex occurs when pressure on the globe results in bradycardia. B. Clinical correlation. Trigeminal neuralgia (tic douloureux) is characterized by recurrent paroxysms of sharp, stabbing pain in one or more branches of the trigeminal nerve on one side of the face. It usually occurs in people older than 50 years of age, and it is more common in women than in men. Carbamazepine is the drug of choice for idiopathic trigeminal neuralgia. Figure 10-3. The jaw jerk (masseter) reflex. The afferent limb is V-3, and the efferent limb is the motor root that accompanies V-3. 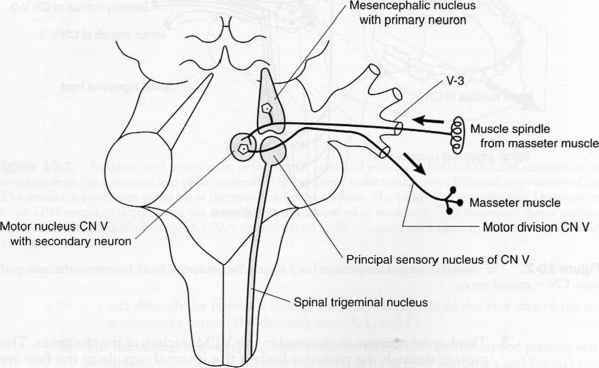 First-order sensory neurons are located in the mesencephalic nucleus. The jaw jerk reflex, like all muscle stretch reflexes, is a monosynaptic myotactic reflex. Hyperreflexia indicates an upper motor neuron lesion. CN = cranial nerve. Figure 10-4. 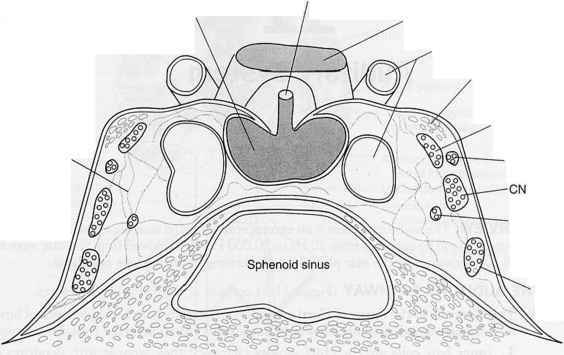 The contents of the cavernous sinus. 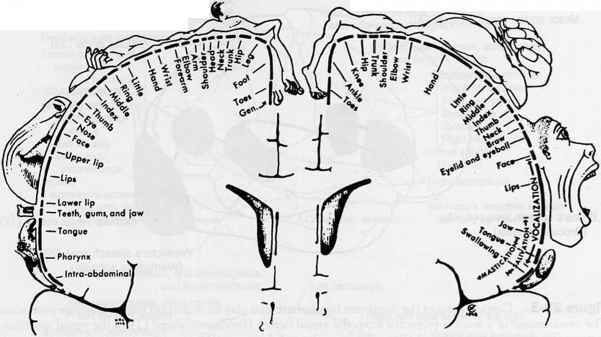 The wall of the cavernous sinus contains the ophthalmic cranial nerve (CN) V-l and maxillary (CN V-2) divisions of the trigeminal nerve (CN V) and the trochlear (CN IV) and oculomotor (CN III) nerves. The siphon of the internal carotid artery and the abducent nerve (CN VI), along with postganglionic sympathetic fibers, lies within the cavernous sinus.